I can stick to my diet all day, but the evenings just go to pot. Help! Here's the scenario: You've eaten a healthy breakfast and a reasonable lunch. Dinner is a grilled chicken breast with salad and small jacket potato, and for dessert, fresh fruit. But at 9pm you're sitting on the sofa watching your favourite TV programme, and at the first commercial break you're in the kitchen with your hand in the freezer. Just a couple of spoons you promise yourself. By somehow, by the end of the evening, you've polished off the entire tub of Ben & Jerrys. And you feel really awful for failing [again!] - not to mention a little queasy! Sound familiar? Are you good during the day, but at night you can't stop snacking? If so, you're not alone. But the good news is that you can deal with this problem by adopting smart strategies. 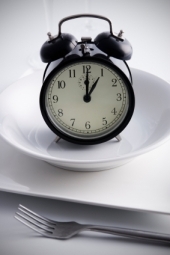 According to the National Institute of Health, it doesn't matter what time of day you eat. It's what and how much you eat, and how active you are during the entire day that determines whether you gain, lose or maintain your weight. The problem with snacking at night is that usually people are not saving up calories during the day to eat at night. First, you need to identify why you are eating late at night. Are you really hungry, or are you bored, distracted, anxious or even tired? Next, develop ways to avoid the situation, or smart ways to control your hunger. For example, if you find that you need to eat something before bed, cut out a snack during the day, or reduce the portion size of your dinner to save the calories for later. Eat dinner later. This may not work for everyone. If you have a set schedule, or family that requires you eat earlier, skip to the next tip. Take two items from dinner to eat two to three hours later. This works for people who have to eat earlier, but get hungry after dinner. During dinner, stop eating when you're full, even if there is food left on your plate. Save whatever you don't eat, and plan to eat it two hours later - if you feel hungry by then. Plan for a sweet snack if you have a sweet tooth. Choose frozen yogurt instead of ice cream, or a low calorie and fat chocolate dessert to satisfy your sweet desires without impacting your waistline. Buying a single pot is a safer idea as it is portion controlled and avoids the temptation of 'just one more spoon'! Eliminate problem foods. If you over-eat on chips, crisps or ice cream, stop buying them! Don't even have them in the house. If they're not there, you can't eat them. Buying your favourite foods on the basis that "I'll leave them alone" is just kidding yourself! Replace with foods like crunchy vegetables and low fat yogurt and fruit, for a quick, healthy and filling fruit smoothie. If it is not possible to eliminate all tempting food because of the rest of the family, then keep it out of sight. Don't leave food on the worktop or visible everytime you open the fridge or a cupboard. A clear glass cookie jar right next to the kettle is asking to fail! Put biscuits and chocolate into a tin at the back of the cupboard. 'Out of sight, out of mind' really does work! Portion out snacks. Portion control is the secret of weight maintenance. All foods can fit into a healthy diet, but only in the serving size that makes sense for your goals. For example, 1 oz of pretzels (small handful) has about 120 calories; the whole bag can have up to 300 calories. Dry breakfast cereal can also be a low calorie, satisfying snack. It is important however to cut out a midday snack to compensate for your night snack, or you will consume too many calories and eventually gain weight. A good bedtime treat is a mug of low calorie hot chocolate at around 40 calories; there are also loads of flavours to choose from. Or try a soothing herbal tea. The warm drink will also help you sleep. Taking the dog for a walk - or even just yourself! Do something that is completely different to the trigger that would cause you to start snacking, for example don't sit in front of the TV if as soon as you do you want to eat.